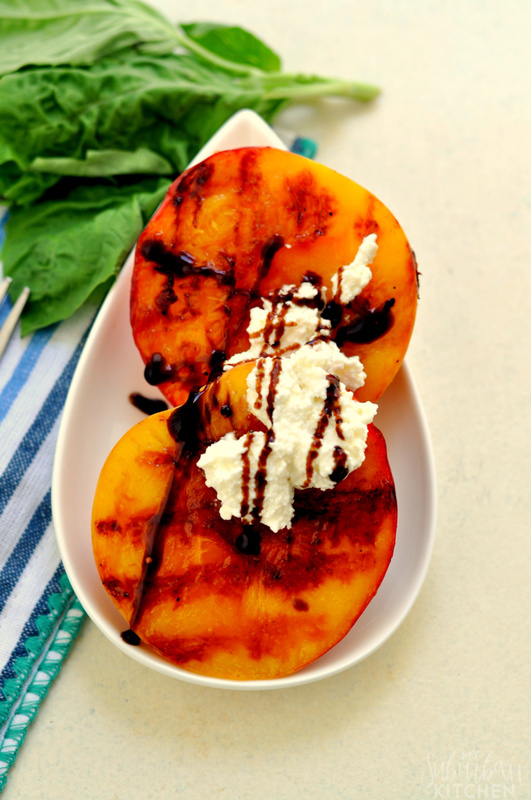 Grab a little bit of summer on your fork when you dig into Grilled Peaches With Ricotta! 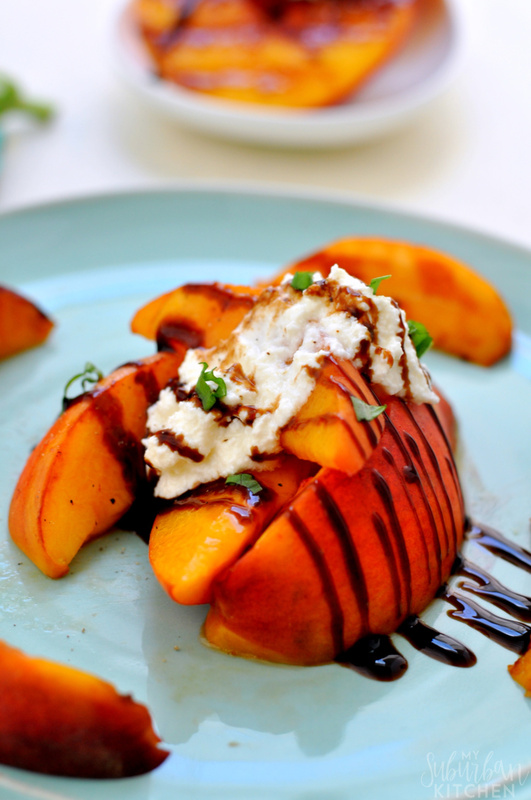 Grilling peaches brushed with honey brings out their natural sweetness! 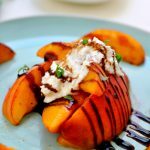 Adding a scoop of ricotta that is topped with a balsamic glaze gives this peach recipe a burst of summer flavor! When we were in California at the end of July, Mathlete and I ate at The Girl and the Fig in Sonoma. For several days before, we had eaten really large meals at different restaurants so we went to dinner that night looking for just a few small items. 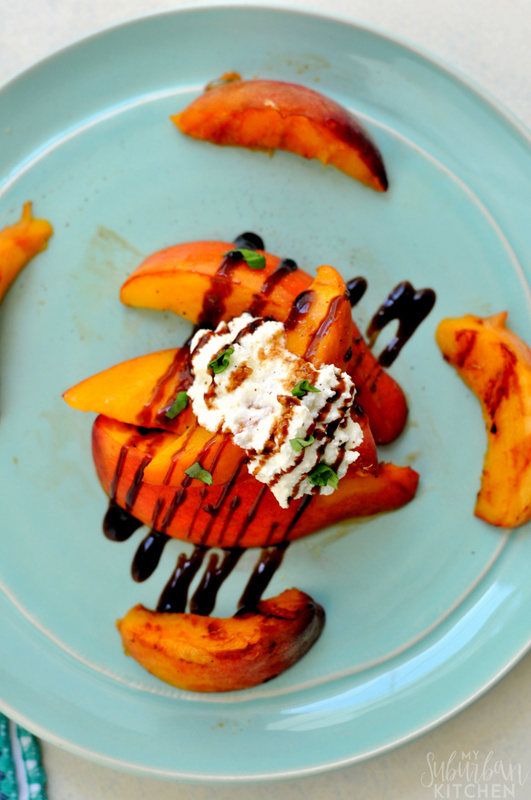 One of the choice that night was grilled peaches with ricotta. Of course, we had to order it and it was so amazing that I came home determined to recreate the meal at home. Summer is the perfect time of year to enjoy this dish too. Peaches are still in season and the weather is perfect for grilling. 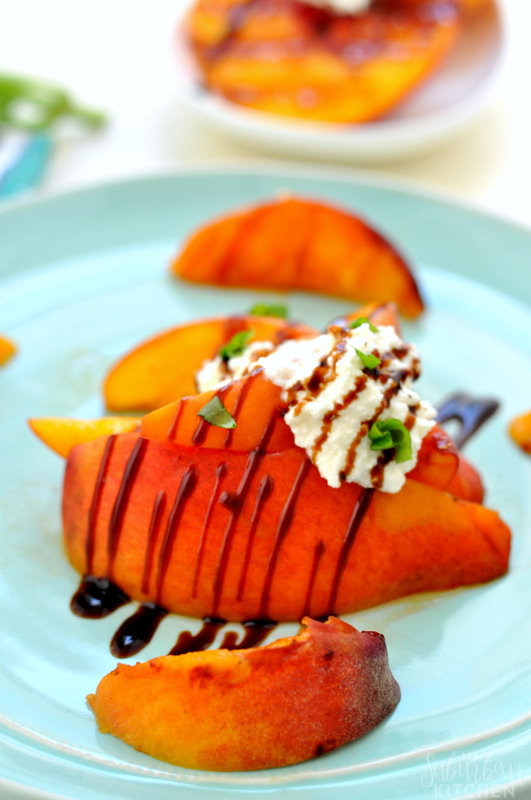 The grilled peaches with ricotta make a great appetizer but you could also use it as a not too sweet dessert too. I like to make my own ricotta cheese so I’ve included the instructions for that. If you’ve never made homemade ricotta, definitely give it a try. It is way better than most store bought options. If you prefer, many higher end grocery stores sell fresh ricotta that you can use in place of the homemade version. These peaches are just so good. Grilling them brings out their sweetness and it tastes amazing with the homemade ricotta and balsamic glaze. You can easily find balsamic glaze in stores now. But, it is super simple to make and can be used in a TON of different recipes. Definitely be sure to pick up fresh basil when you are shopping for ingredients. It is the perfect garnish on the top of this recipe. 1. Line a large sieve with cheesecloth and place over a bowl. 2. Slowly bring the milk, cream and salt to boil in a heavy pot over medium-high heat. Add lemon juice and reduce heat to low. Simmer, stirring constantly, for about 2 minutes or until the mixture begins to curdle. Pour into lined sieve and let drain for 1 hour. Discard the liquid and chill the ricotta in the refrigerator. 1. Heat grill to medium heat. 3. Place peaches on serving dish. Top with homemade ricotta and drizzle with balsamic glaze. 1. You will not use all of the ricotta with this recipe. yum, that looks amazing. the peaches this year have been killer and of course cheese makes everything better, lol. we ate there during sonoma restaurant week, which was taking place while we were there on vacation. so yummy!